I really should be posting about James and Trix's wedding but I know that that post will require some thought. I'll talk about Gino's birthday at Greyfriars instead. My family in the morning finally put Gino to rest in a little niche at Glen Oaks. Since it has a glass front, we personalized it by putting a small guitar hero, a basketball medal, poker chips, a concert ticket, a picture frame, etc...the niche really defines who Gino is. Later in the evening, G's friends met us back at Glen Oaks for about an hour and then we all went to the pub for Name That Tune (which I don't think anyone played). Here are some pictures from that night. The first two are of the cupcakes that I bought at The Cupcake Shoppe on Monday and it traveled with me everywhere I went. It wasn't until we were on our way to our last destination that I dropped the box in the car and the cupcakes tumbled all over the place. A special thanks to Tita for ordering all the food at Greyfriars. It fed everyone! After the drop...they still kinda look good right? L-R: Tammy, Frances, Jack, Tyler and Ryan D.
Last Tuesday was a great night. Gino would have been proud of everyone that came out for his birthday. Being with people who knew my brother of special occasions like this helps me get through what would have been a tough day for me. I am thankful that Gino had such great friends who still really care about him and also about me and my family. Happy 27th birthday G! We wish you were here with us today but I know that you are with us in spirit. We are going to celebrate like you would have for your birthday. We will be thinking about you and miss you like crazy. We'll be at your regular Tuesday spot with all your friends and family. I hope you are resting peacefully. Love ya! My parents were over visiting last Sunday and FINALLY, Mike and I convinced my dad to try out the Wii. My mom would always come over before and play on her own or with Gino. Gino and I always tried to get my dad to play but he was too shy. But after a few drinks, he gave in and tried out bowling with my mom. My dad did well for his first time. He even got a couple of spares and a few strikes. Then, my mom suggests that they try boxing...well, it was pretty interesting. My dad won but only after a long battle with my mom. Seeing these two dukes it out brought tears to my eyes - tears of laughter!!!! I was really nervous about going to Stephanie and Jason's wedding. I was going to miss my brother because he was suppose to attend. I was also nervous for my mom because I knew that she would be thinking about Gino all night and also that my stepdad was not going either. In the end, it was a fun wedding. The ceremony was beautiful. Mike and I were part of the wedding. We did the cord part. Stephanie had a stunning dress and Jay looked quite handsome. The reception took place at Angus Glen, a swanky golf club. Mike and Mark Aquino did a fine job emceeing. S & J did a dance number to "Heaven Must Be Missing An Angel" - who knew Jay could dance. The program finished earlier than expected which meant more time for drinking and dancing. 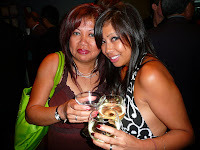 Of course, yours truly got drunk. Jon and Charm closed the dance floor and then it was off to the hotel. That's it for today...stay tuned for a recap of Trix and James' wedding and Family Wii Boxing. I have been MIA for about two months but I am coming back with three posts in one day. 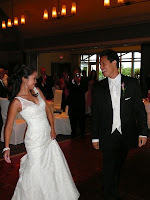 My next post with be a recap of Stephanie and Jason's wedding on August 8, 2008. I think it's a great idea and I love these two guys for coming up with it. Gino would be so proud because he eventually wanted to get t-shirts printed for the store. We miss you "G"!!!! I have been writing in a journal though. I write as if I am talking to G. I haven't written in a journal/diary in ages but I thought that if I started writing about my thoughts and memories of Gino, one day my kids (if Mike and I do end up having one or two...) can read about their uncle - who he was, how much fun he was to be around, the good times I had with him and what we use to talk about. Do you have a journal that you keep and that you can look back on years from now?